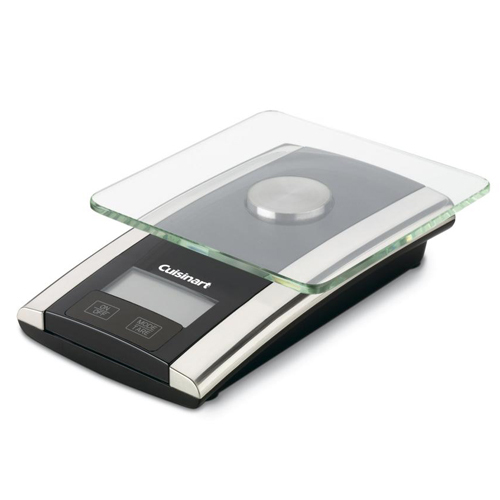 The Cuisinart KS-55 WeighMate digital kitchen scale has a tempered glass weighing platform to control portions and bake with greater consistency. It has a built in easy-to-read digital screens which offer complete accuracy and easy cleaning. Also features tare feature allowing you to use any container when weighing your food items. The KS-55 features add 'n' weight which allows you to weigh multiple ingredients without starting from scratch by adding ingredients one at a time to a single container. The scale displays weights up to 11 pounds and is accurate to 1/8 ounce. This Digital Food Scale has a stainless steel cover, is dishwasher safe and the touchpad button is styled for easy cleaning. The Weighmate Digital Kitchen Scale has many exciting features for users of all types. You can extend the lifetime of your Weighmate Digital Kitchen Scale with the purchase of a FactoryOutletStore Factory Protection Plan. See the Weighmate Digital Kitchen Scale gallery images above for more product views. The Weighmate Digital Kitchen Scale is sold as a Brand New Unopened Item.